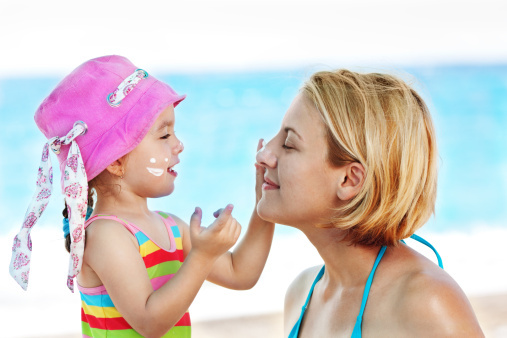 Solaveil is a range of inorganic sunscreen filters that provide protection from the sun’s harmful ultraviolet (UV) rays. Sunscreen filters can be put into two broad categories, organic and inorganic filters. Solaveil™ is a range of inorganic filters. Organic filters are chemical based and they form a thin protective film on the surface of the skin and absorb UV radiation before it penetrates the skin. Inorganic filters are mineral based insoluble particles, such as titanium dioxide (TiO2) and Zinc oxide (ZnO), that scatter and absorb light resulting in UV rays being reflected away from the skin. These inorganic sunscreens are the most natural form of UV filter and are photostable which means they do not deteriorate when exposed to light, therefore offering assured consistent protection when exposed to UV light. They are also mild and kind enough to use on sensitive skin, even that of a child or baby, without any irritation and are safe to use in daily skincare and beauty applications. Solaveil SpeXtra Titanium Dioxide This product would be used by a manufacturer as a single active ingredient to give protection from both UVA and UVB rays. Solaveil Clarus Titanium Dioxide This product would be used by a manufacturer as an active ingredient to protect against UVB rays and appear completely clear on the skin. Solaveil Clarus Zinc Oxide This product would be used by a manufacturer as an active ingredient to protect against UVA rays and appear completely clear on the skin. Manufacturers would use the relevant Solaveil product in order to create the desired UV protection for their sun care, skin care or cosmetic product. Each product is made to Croda’s strict high standards, therefore all you need to look out for is the Solaveil brand on pack.